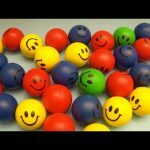 Learn Colours with Smiley Face Squishy Balls! Fun Learning Contest! Have fun learning, spelling and identifying colours! Music Written, Composed, Produced and Performed by Baby Big Mouth! Learn Colours with Smiley Face Drums! Fun Learning Contest! Learn Colours with HUGE Smiley Face Squishy Balls! Fun Learning Contest! Learn Colours with Smiley Face Shakers! Fun Learning Contest!